Source of protein. High fibre. 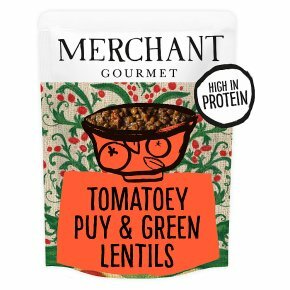 Suitable for vegans.This product was previously called Puy Lentils with Sundried Tomatoes and Basil. It's still the same delicious Puy Lentils cooked in the same rich flavoured sauce of sweet sun-dried tomatoes, onions, garlic and fresh basil with a mixture of Green Lentils. Easy to prepare Squeeze the pouch to loosen the grains. For best results, heat through in a pan with a dash of water. Otherwise, tear a 2cm opening at the top and microwave for 45s at 900w, or simply enjoy it cold. Great creative ... with a sausage cassoulet! Stir these lentils into a pan of tomatoey stock. Slice and fry some sausages and carrots - add to the mix and simmer for 20 mins, before serving. Fancy me hot?Squeeze me.To loosen the lentils then tear me open by 1cm.Heat for 1 minute (750W).Open then enjoy!Watch out for the steam.